Inez McCormack is the subject of a new documentary. McCormack would have had a glint in her own eye had she witnessed the turnout for a recent screening of a documentary on her life in Manhattan. Jointly hosted by New York State Comptroller Tom DiNapoli and the Service Employees Union (SEIU) local 1199, the event took place at the union headquarters on 42nd Street on April 9th. Local 1199 represents home care and healthcare workers, primarily women, mostly immigrants, and they turned out in droves for the screening. 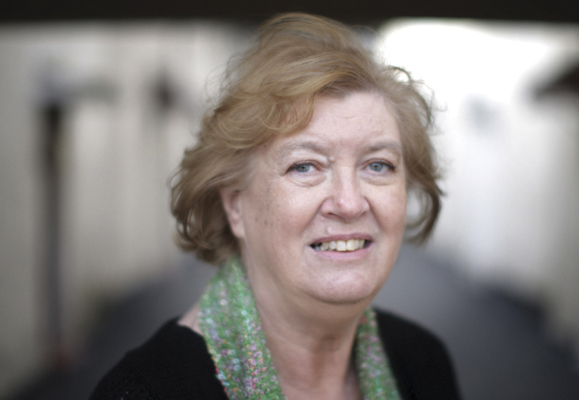 Titled Inez McCormack: A Challenging Woman, the film focuses on McCormack’s work as a union organizer (she was the first female president of the Irish Congress of Trade Unions), her role in Northern Ireland’s peace process (she fought for the inclusion of women in the Good Friday Agreement), and the Belfast human rights organization she founded, Participation and Practice of Rights (PPR). Among those on hand to offer accolades was Susan McKay, the award-winning Northern Ireland journalist and writer who, working with filmmaker Trever Brindley, produced and narrated the documentary. In the documentary, scenes from McKay’s final interview with McCormack, who left hospice to take part in the project, are matched with scenes of her as a young activist organizing striking hospital workers in Belfast, and visions of Northern Ireland in the early days of the Troubles. And interspersed throughout the film are tributes from many of Inez’s admirers, including Hillary Clinton; Mary Robinson, the former president of Ireland; and Irish President Michael D. Higgins. “They were lining up to take part,” said McKay. The screening was bookended by more tributes. New York’s Deputy Consul General Anna McGillicuddy called Inez an “inspiration.” Patricia McKeown, who now heads the Irish Congress of Trade Unions, said that it was always difficult to be the first anything, and that Inez, as the first woman president of the union, was “a battering ram” against prejudice. George Gresham, president of Local 1199, said SEIU was Dr. Martin Luther King’s favorite union, with the responsibility and legacy to fight for working people. And it was the women who spoke from the audience, often in halting English, who won the day. “I just want to say thank you for caring,” an immigrant from Colombia said. There was a glint in her eye.